This week, as I was packing up our china cabinet for an upcoming move, the cabinet detached from the wall and everything still in it fell out on the floor. 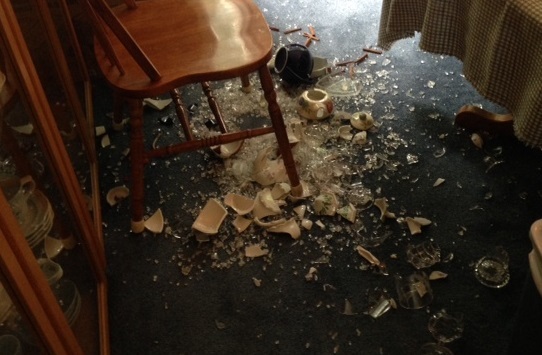 As you can see from the photo, there was a lot of china and glass smashed into little bits. There is nothing quite as shocking as watching shelves full of breakable things fall in front of your eyes while you stand by, helplessly watching the destruction. There were some things saved in the fall. One was a set of four glasses that we received as a wedding present. They were made of thick glass and although they were on the top shelf of the cabinet, they merely bounced and rolled when they hit the pile of debris. What a great wedding present–something we can use for the duration of our marriage as these glasses are obviously going to endure! They remind me of people who are able to stand without falling through the trials of life. They seem to be naturally strong and resilient like these glasses. The other thing that did not break was my English teapot. My parents bought it for me many years ago in England and I think of my mother, who is now with the Lord, every time I use it. Amazed, I picked up the teapot and its lid, which had fallen in different spots on the mound of shards and inspected them. There wasn’t a crack or even a chip in either of them. How could this teapot have survived when the rest of my teapot collection had smashed to smithereens?! How do frail, weak people who we think will fall and be destroyed in difficult circumstances, stand strong and prevail? The only possible explanation is that they, like my teapot, are protected, saved by the hand of our Heavenly Father. They are like Christian in The Pilgrim’s Progress who was saved from the City of Destruction. They aren’t strong in themselves but the Lord is their Helper and Shield in the raging tide of life. Another lesson I learned from this event was that it is necessary to separate the things I really need and love from the jumble of things that I own. Every time I attempt to weed through my things, whether they are china and crystal or clothing or books, I struggle with knowing what to keep and what to give away. So often I keep far too much. This domestic disaster helped me to see that the Lord can sift through my material possessions and save the truly important (glasses that will have much use; a much loved teapot) while ridding me of the rest, even family antiques which I’m sorry to lose. He will also sift through my heart and my mind, ridding me of my chaff, my sins, and only saving the righteousness of Christ in me. I’m sure that there will be more lessons learned from this breaking of precious things. For now I will rejoice in what was saved and work on letting go of what I lost. Every contradiction of our will, every little ailment, every petty disappointment, will, if we take it patiently, become a blessing. So, walking on earth, we may be in heaven; the ill-tempers of others, the slights and rudenesses of the world, ill-health, the daily accidents with which God has mercifully strewed our paths, instead of ruffling or disturbing our peace, may cause His peace to be shed abroad in our hearts abundantly. Are you afraid to be alone with your thoughts? Does the thought of being still and quiet with no outside distractions turn you off? Are you bored when your cell phone dies while sitting at a doctor’s office? When you are alone in the car, can you drive without the radio or phone or audiobook and just think? According to a study done by a professor at University of Virginia, a large majority of Americans would prefer not to be distraction-free for even a few minutes. Even more amazing is the fact that many of them would choose to give themselves an electric shock rather than be alone with just their thoughts to keep them company! This amazed me because I yearn for time alone–to pray, to think, to write blog posts in my head, to simply be. Part of the charm of gardening to me has always been that I am alone outside and don’t have any distractions (as long as the children don’t need me). When I worked in a molecular biology lab, I used the many hours of running gels and preparing for experiments alone in a little room and used the time to memorize poetry, hymns, and Scripture. My son and I discussed this study and wondered if the reason people these days seem to need constant stimulation is due to the fact that our culture, as a whole, is on the downswing and there is a lack of wholeness in our culture, our communities, our families, and our own person. That lack of wholeness, of integrity, leads us to want to flee our thoughts because we don’t know what to think or how to think it anymore. We also wondered if there was a difference in results between introverts and extroverts or if the results were spread evenly as they were in age group (although not in gender). And yet, part of me understood these results. As I mentioned in an earlier post, I too am easily distracted these days– by outside noises, electronics, and busyness–and will often pick up a book rather than be completely still. I rarely stop and just think. However when I do set that time aside, even for ten minutes, I am refreshed and enriched as I pray and ponder things in my heart. I think there is a reason why the Bible exhorts us to pray and meditate. Through prayer and meditation on truth and goodness and beauty, our hearts and minds are reminded of what is true, noble, just, pure, lovely, of good report, of good virtue and praiseworthy. I am slowly adding in time to write letters and journal. I am finding that forcing myself to slow down and write with pen on paper allows my mind to dwell more deeply on what I am writing and thus meditate more on the truths I am copying or communicating. Meditation and prayer time is a time to be alone with my thoughts and with God. I believe that as my thoughts are more focused on the “things above“, my life will be fuller and more whole and richer for me and for all those around me.